Part of ‘Creating Great Love’ is having a willingness to be playful. As adults we can sometimes lose touch with this wonderful childlike energy. Life can become so serious as responsibilities take over. However it is truly vital that we find time to play!! Playing can also be about relaxing or going on vacation. It can also be about letting your beloved see you being silly and letting down your guard. I believe that is why Disneyland is so popular for adults, as it gives us the space to allow ourselves to play even for just a day. I mean where else would you see grown men and women walking around wearing Mouse Ears and Goofy Hats!!! In my experience having the ability to play is a gift that I treasure because I know it not only enhances my relationships, it also makes life so much more pleasurable and fun!!! This week I encourage you to find some time to just PLAY!!! My picture this week while driving around town is truly a miracle!!!!!……. 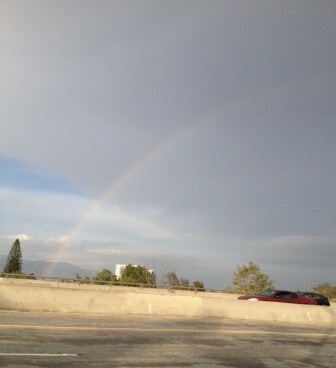 This rainbow only lasted a few minutes and I was able to capture it while driving on the freeway. (No easy feat!) Rainbows are always a special symbol to me that all is well and something truly magical is happening! This entry was tagged Create Great Love, Disneyland, Love, Miracles, Playful, Rainbow, Relationships, Willa Cather. Bookmark the permalink.